When was the last time we’ve been able to say that the Energy sector was a market leader?Well, you can say it now. 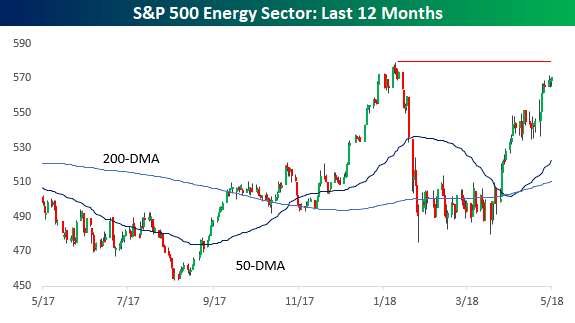 While the S&P 500 is still over 5% from its 52-week closing high, the Energy sector is knocking on those levels and is currently down just 1% from its closing high.In fact, while Technology gets all the attention these days for its leadership, it as actually slightly further below its 52-week high than Energy. 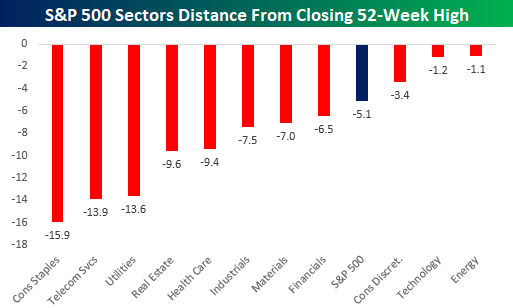 Granted, Technology has a much larger weighting and is, therefore, more impactful on the overall index, but strictly in terms of how far each sector is from its closing 52-week high, Energy is on top. Behind Technology and Energy, the only other sector that is closer to its 52-week closing high than the S&P 500 is Consumer Discretionary (-3.4%).As far as the laggards are concerned, three sectors are more than 10% from their 52-week highs and they are all defensive in nature (Consumer Staples, Telecom Services, and Utilities).Given the fact that the S&P 500 is in the middle of a correction, you would think that defensives would be holding up well, but at this point, investors aren’t interested. With regards to the Energy sector specifically, the sector has had quite a run off its early April lows and rallying over 20%. While the sector is certainly overbought in the short-term, from a longer-term vantage point, you wouldn’t believe that the sector was performing well. The chart below shows the relative strength of the Energy sector versus the S&P 500 going back to 1980. When the line is rising, it indicates that the Energy sector is outperforming and vice versa. Ever since the middle of the last recession, the Energy sector has been a near constant underperformer vs the S&P 500. If you look really closely at the chart, you can see that the relative strength line for the sector has stopped going down, but remains right near 14-year lows.From this vantage point, however, the recent rally barely even registers.